Rescuers were using dogs, backhoes and shovels to search Friday for survivors trapped in mud and debris from landslides triggered by a powerful earthquake in northern Japan. At least 16 people were dead or presumed dead after scores of hillsides collapsed, burying homes on the country’s northernmost main island of Hokkaido. The magnitude 6.7 quake early Thursday unleashed scores of landslides that buried homes in avalanches of soil, rock and timber. 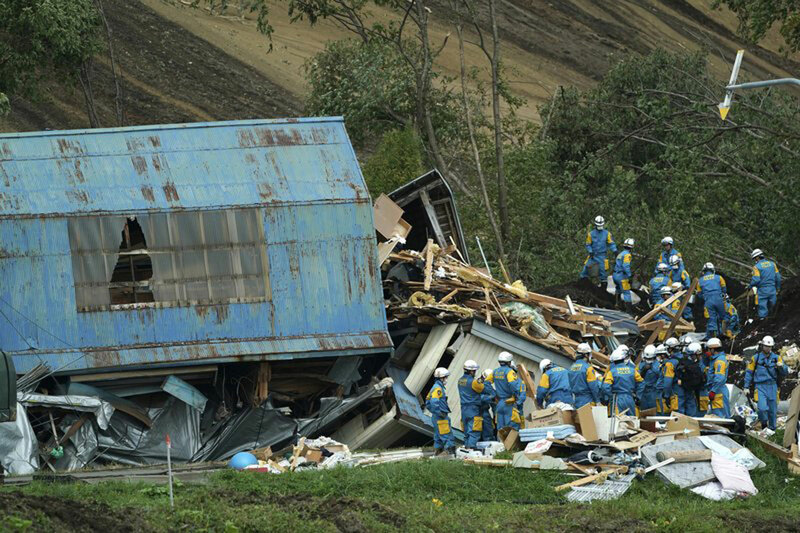 In Atsuma, a town of about 4,600 people, 26 were still unaccounted for. The landslides ripped through some homes and buried others. Some residents interviewed by national broadcaster NHK described awakening to find their relatives and next-door neighbors gone. Prime Minister Shinzo Abe said nearly half of the nearly 3 million households on the island had their power restored after a day of island-wide blackouts. “The forecasts are for rain, and that could bring more landslides, so please continue to exercise extreme caution,” he said. The regional government said the bullet train to the provincial capital, Sapporo, was due to reopen later in the day. The city’s regional airport also was beginning to resume operations after hundreds of flights had been cancelled, stranding thousands of travelers, due to Thursday’s power outage and light quake damage. Hokkaido is Japan’s northern frontier and a major farming region with rugged mountain ranges and vast forests, and its people are accustomed to coping with long winters, isolation and other hardships. It is sparsely populated compared to the rest of Japan, but disruptions were widespread. Many roads were closed and some were impassable. In Sapporo, the regional capital and home to 1.9 million people, casualties were relatively light. But damage to some parts of the city was severe, with houses atilt and roads crumbled or sunken. A mudslide left several cars half buried, and the ground subsided, leaving drainpipes and manhole covers protruding by more than a meter (yard) in some places. Economy, Trade and Industry Minister Hiroshige Seko said it would take at least a week to fully restore power to all communities due to damage at a thermal power plant at Tomato-Atsuma that supplies half of Hokkaido’s electricity. “We’re trying to do it faster, but it will likely take a week,” Seko said. He urged residents to conserve power. Japan has had a string of natural disasters in recent months. The quake came on the heels of a typhoon that lifted heavy trucks off their wheels and triggered major flooding in western Japan, and damaged the main airport near Osaka and Kobe. The summer also brought devastating floods and landslides from torrential rains in Hiroshima and deadly hot temperatures across the country.